The Summer issue of American Bungalow magazine has just hit the newsstands, and here's our copy. 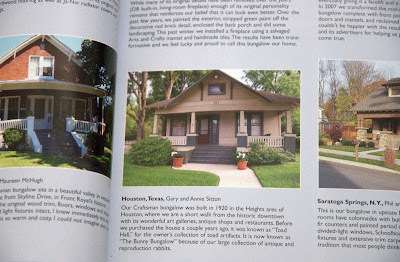 Guess which Houston Heights bungalow is in their Family Album section. That's right! The Bunny Bungalow, right there, with those other gorgeous American Beauties! Tall Husband and I are so excited that we're dancing on air. Thank you, American Bungalow; you have made our day. You have a wonderfull place!How fun to be recognised . Congratulations! That is fantastic...what fun and what an honor!!! We should thank you! If it weren't for efforts and accomplishments like yours, we'd have nothing at all to publish. All we can do is show what you—and others like you—have done. HOW VERY COOL!!!! Congratulations. I was trolling your neighborhood this weekend at garage sales (Arlington & 24Th). Got some really cool things that I will blog about. Congrats again....I'm popping over to the American Bungalow Blog now to soak it all in.